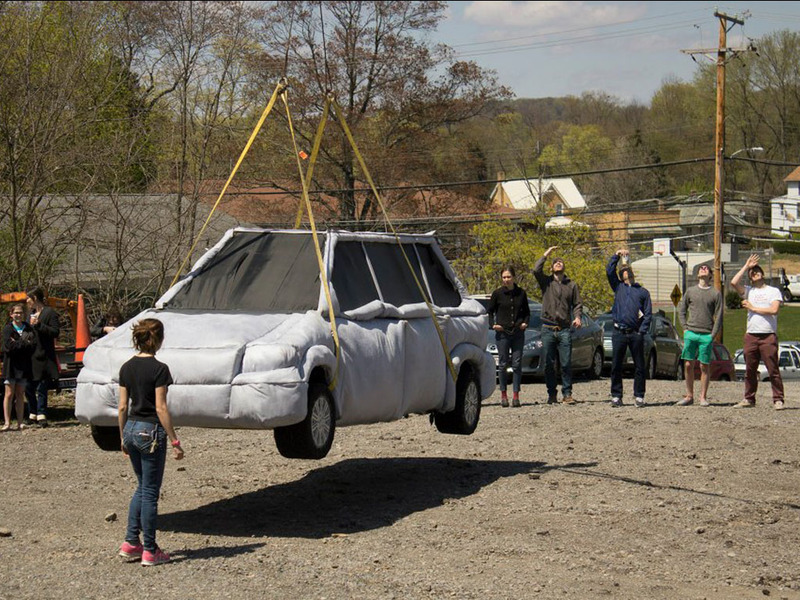 For Minivan Drop, CMU School of Art senior Emily Wobb built a full-sized upholstered replica of a minivan and commissioned Wayne Blumling – owner of Wayne’s Crane and Tree Removal – to drop the sculpture from 150 feet in the air. From the broken pieces, Wobb built a couch that sat facing a widescreen TV set playing the Minivan Drop video at the I’m Feeling Lucky senior thesis show at the Miller Gallery. 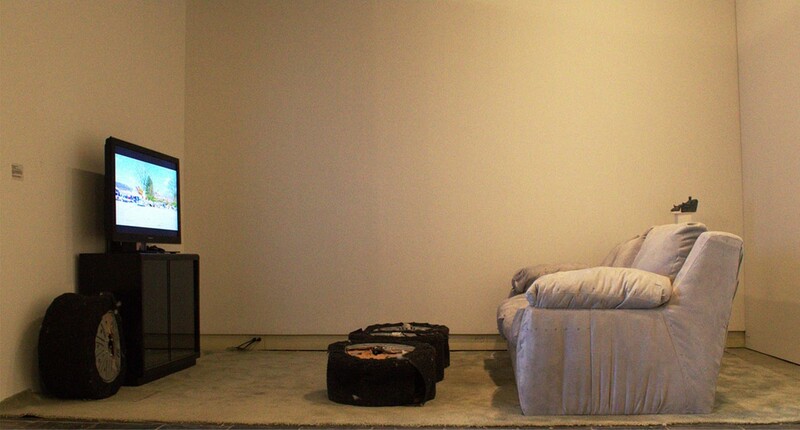 By destroying an iconic feature of suburban family life and presenting the performance in a mock living room setting, Wobb aims to begin a conversation about American fascination with the spectacle of death and fatal accidents when the viewer is comfortably detached. Wobb’s performance was featured in the Pittsburgh Tribune [PDF]. Minivan Drop was supported by a grant from the Frank-Ratchye Fund for Art @ the Frontier (FRFAF)— an endowment founded to encourage the creation of innovative artworks by the faculty, students and staff of Carnegie Mellon University. With this fund, the STUDIO seeks to develop a cache of groundbreaking projects created at CMU — works that can be described as “thinking at the edges” of the intersection of disciplines. Emily Wobb is currently a senior in the School of Art at Carnegie Mellon University.